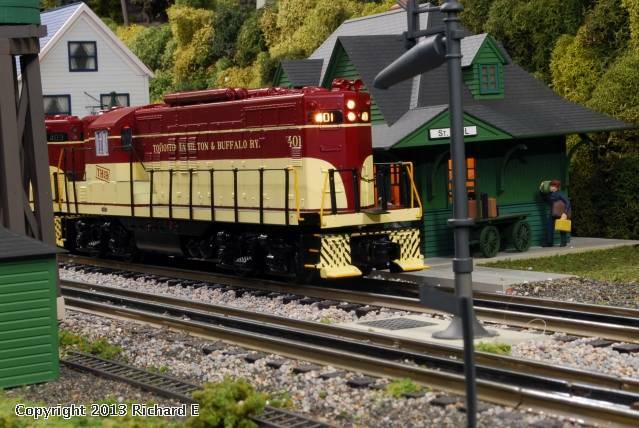 (Guest) J&C Studios O Gauge Archive Photo Poll: Dec. 2013 Shuffling off to Buffalo. Topic: Shuffling off to Buffalo. Early Christmas shopping in Buffalo is less expensive than in Toronto, Eh!! Richard, who is making that paint scheme ? The GP-7s are MTH Railkings from a few years ago. They correctly have the air tanks on the roof and are programed to run long hood forward. As to snow, people living along the Great Lakes understand lake effect snow bands. Depending on wind direction most of it falls to the west of Lake Erie and usually affects the city proper and the southern suburbs. It may be blizzard conditions in West Seneca and sunny in North Tonowanda.